GL501 Peloncillo Mts., NM. 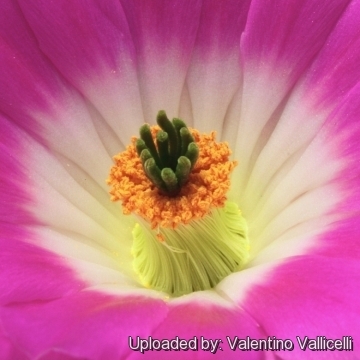 A jewel of the Sonoran Desert, this species has a tight lattice of tiny spines that hide the body of the plant. Origin and Habitat: Echinocereus rigidissimus has a very wide range in USA (south-eastern Arizona, south-western New Mexico), and Mexico (northern Sonora, north-western Chihuahua). The species is abundant throughout its range. Altitude range: 1200-2000 metres above sea level. Habitat and Ecology: Grows on gravely hills, steep canyon sides, rocky benches in semidesert grasslands, oak woodlands, interior chaparral, mostly on igneous limestone substrates. The reported habitat preference for limestone is erroneous; this species is a calcifuge, preferring soils poor in lime and usually acid. There are no major threats for the species, however, land use change is affecting some subpopulations. Echinocereus pectinatus var. rigidissimus (Engelm.) Rümpler in C.F.Först. Echinocereus rigidissimus f. cristata hort. Echinocereus rigidissimus subs. rubispinus f. albiflorus hort. Echinocereus rigidissimus var. albiflorus hort. 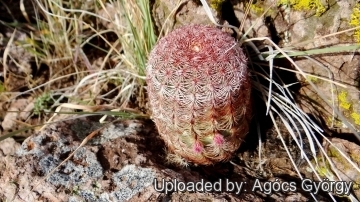 Description: Echinocereus rigidissimus is a low growing solitary (very rarely few branched) cactus. This species is a great favorite in collections, although it does not last long. 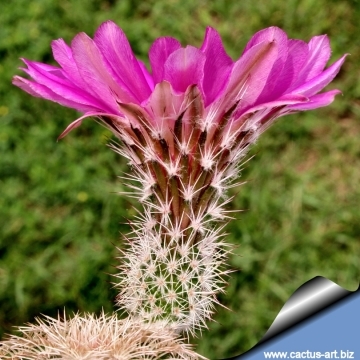 Each year’s growth is differentiated by differently coloured band of spines, hence the common name "Rainbow Cactus". Two subspecies are recognized, the nominate form and Echinocereus rigidissimus subs. rubispinus (G.Frank & A.B.Lau) N.P.Taylor. Stem: Erect, rigid, short cylindric 6 to 20 (-30) cm tall, 4-11 cm wide, usually hidden by the closely set interlocking spines. Ribs: 18-23(-26), low, slightly tuberculate, straight to somewhat undulate. Areoles: Approximate almost touching or up to 2 cm apart, elliptic, 5 to 6 mm long. Radial spines: 16 to 22 stiff, rigid, pectinate, lying flat on the surface of the plant, straight or slightly curved toward stem, grey, reddish brown, bright pink or pink-and-white, somewhat translucent, arranged in horizontal alternating bands of colour around stem, 5-10 mm long. Mature plants with a good light will generally have red to deep pink spines that band the stems. numerous, shorter than the style. Stigma lobes approx. 13 green. Areoles on ovary somewhat floccose, very spiny. Blooming season: It blooms in late spring summer (May-July). Fruits: Globose, greenish or dark purplish brownish very spiny, 3 cm in diameter, pulp white. Fruiting 3 months after flowering. Seeds: Black, tuberculate, 1,5 mm in diameter. 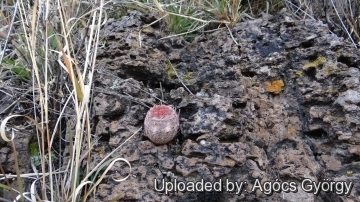 Echinocereus rigidissimus (Engelm.) 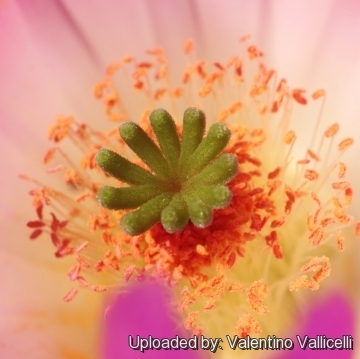 Rose: Stems up to 10 cm thick with 15-23 radial pectinated spines per areole that hide the body of the plant. Each year’s growth is differentiated by differently coloured band of spines, hence the common name Arizona Rainbow. Echinocereus rigidissimus f. cristata hort. : Crested form. Echinocereus rigidissimus subs. rubispinus (G.Frank & A.B.Lau) N.P.Taylor: (a.k.a. Ruby Rainbow) has stems that only get about 7 cm thick with 30-35 shorter radial spines per areole. 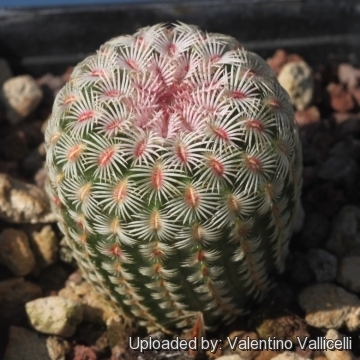 The spines are also more Ruby/pinkish coluoured compared to the 'rigidissimus' subspecies and are some of the showiest in the cactus kingdom. Echinocereus rigidissimus subs. rubispinus f. albiflorus hort. : has white flowers and paler creamy white spines, all the other characteristics namely size and shape of spines, stems, flowers, fruits, roots etc.it is comparable to the standard from. Notes: E. rigidissimus, lacking central spines, belongs to the Echinoceeus reichenbachii group, unrelated to the superficially similar Echinocereus pectinatus group, which has at least microscopically visible stubs of central spines. 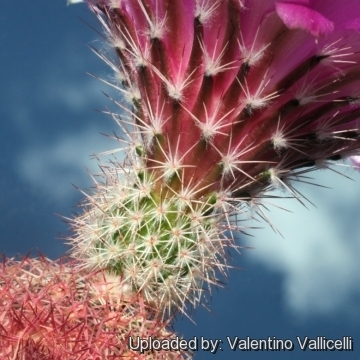 It sometimes occurs with Echinocereus pseudopectinatus but without evidence of hybridization. 8) Terry, M. & Heil, K. 2013. Echinocereus rigidissimus. The IUCN Red List of Threatened Species. Version 2015.2. <www.iucnredlist.org>. Downloaded on 25 July 2015. 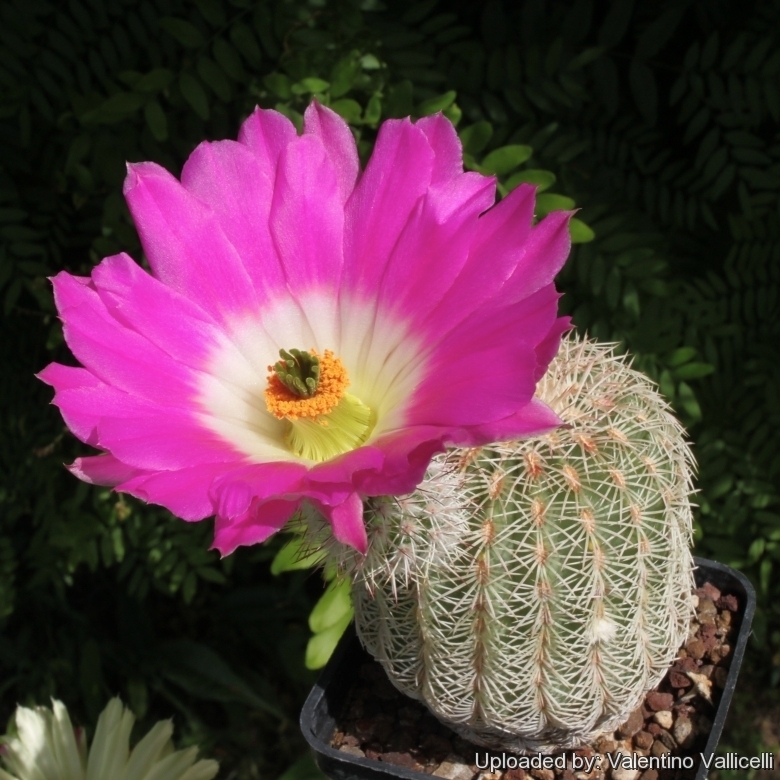 Cultivation and Propagation: Echinocereus rigidissimus is not the easiest cactus to grow, but when grown well it is very attractive. Rot easily it is sensitive to overwatering (rot prone), so perfect soil drainage is a must. Soil: It prefer a neutral to slightly acidic compost with plenty of extra grit. Watering: Best if watered with rain water and given an occasional tonic of sequestrated iron. 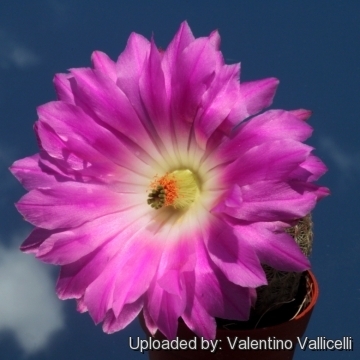 Exposition: In the summer they need an airy location in bright sun; well watered when it's hot. To achieve the best spine colours give these plants lots of sun. In the winter light, cool, and absolutely dry conditions. Hardiness: Very cold resistant above approx -12° C or less for short periods of time. In mild climate it may grow well when planted freely outside in well-drained soil.